Following on from Making Tactical Pricing Work for You: Discounts, which looked at the types of discounts you can choose in SuperControl and how to set them up, this time it’s all about Special Offers. 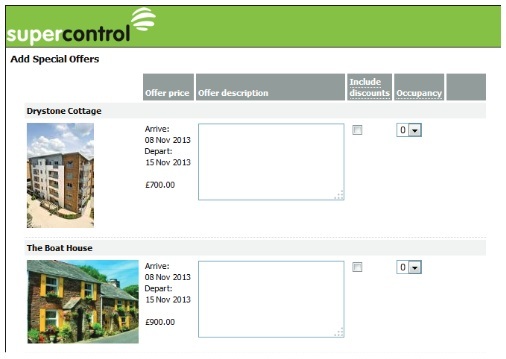 To set-up a special offer in SuperControl go to Bookings > Availability search. Here you need to search by dates you want to create your offer for. Once you click search it will show what properties are available. To add them as a special offer, tick the required properties (you can over-ride the price to amend the normal rate) and then click Add to special offers. Here you can add in a description of the special offer, if you want to include discounts in addition to the special offer you can do this by ticking the box. With regards to occupancy, if you want the special offer to pull through regardless of how many occupants have been entered then leave this as ‘0’. If you want the special offer to pull through for 6 people only, then select ‘6’. When you have done this, click Save. To view your special offers at a later stage go to Bookings > Special offers. In the next blog in this series, we will show you how to set up Vouchers.